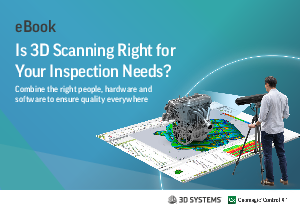 > 3D Systems > eBook: Is 3D Scanning Right for Your Inspection Needs? Combining the right people, hardware, and software to ensure quality everywhere. Quality and reliability matter more than ever. In today’s hypercompetitive environment, companies can’t afford to lag behind when it comes to the quality of their products. And management can’t lag behind when it comes to adopting new tools and technologies to ensure quality everywhere. for its accuracy, reliability, speed, and ease of use. Its noncontact nature and exceptional flexibility make it ideal for measuring a wide range of parts in a wide range of places. An effective approach to 3D scanning requires matching the right people with the right hardware and the right software to best meet your company’s measurement needs. This eBook will help you determine if 3D scanning is right for your inspection needs, and if it is, how best to go about implementing the technology in your business.